Welcome to the webpage that tells you how to create templates to be able to print out verses on card inserts, This was kindly supplied by Peejay for the free use of Verses4cards users. Peejay is an active member of the iSpace Card Making Community which regularly comes up with a host of tips, hints, ideas. 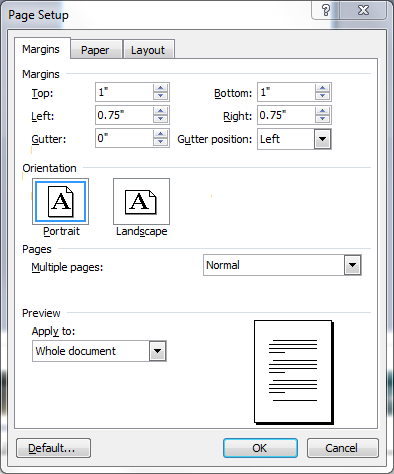 Once again go to ‘Page Setup’ from the ‘File’ menu Click on the ‘Margin’ tab and set the margins as 1cm for top and bottom and 1.17cm for left and right (1.25cm from edge of header & footer). Click on OK. This allows for the insert to be trimmed with fancy edge cutters/trimmers/scissors because you will usually find that a true A5 piece of paper, once printed and folded and placed inside the card, is actually a little too large and would benefit from a ‘light’ trim!! You have now completed the first step and have the base to create your template. You should now have a screen looking something like this…, which is the table you now need to work on. Highlight the first section of the table and either select ‘Table Properties’ from the ‘Table’ menu or right-click and select ‘Table Properties’ from the menu that appears. You should get a box like this…. Click on ‘Column’ and change the width to 8.5cms. Click ‘Next column’ and change that to 2cms. Click ‘ Next Column’ again and change that to 8.5cms to match the first column. Click OK. Your template (yes, nearly there!!) should now look something like this…. Anyway, to position the text, click in the cell you want to format and then you can either select ‘Table Properties’ the ‘Cell’ tab and click on your preference for top, centre or bottom and click OK or…………… ………… you can right-click over the cell, select ‘Cell Alignment’ and then make your choice from the little box that shows to the side.Your cursor should now blink in the position that you have selected. You have now completed your template!! To access the template for use all you need to do is to open it from the ‘File’ menu, select ‘New’ and then select your template from the choice presented to you under the general tab – make sure you select it to create a new document unless you want to use it to create a new template – in which case, select it as a template! !